A quick shot of my lunch before it has gone. 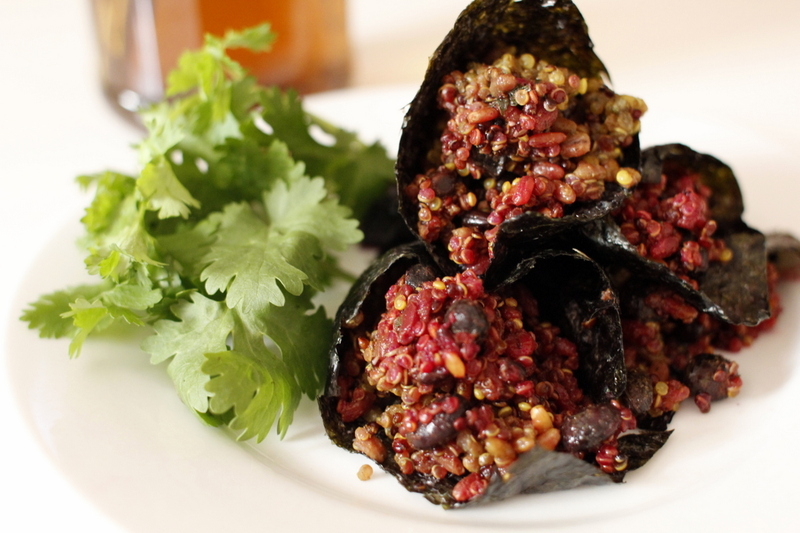 I made a simple nori wrap with quinoa and black beans. I only found out about quinoa a.k.a “the gold of the Incas” a couple of years ago as I started my clean eating. It is popular now that you can find it easy at the local health shops. Surprisingly, most quinoa comes from South America where it is grown wild and pesticides are not used. So you don’t have to worry too much about buying ‘organic’ foods as it is naturally organic. Shame I didn’t know about it almost 30 years! I even introduced to my mum back in Korea where quinoa is not that common yet and hard to find. She has fallen in love with it now since I taught mum mixing quinoa through rice for more nutrition and flavour. These little guys are without doubt one of the superfoods. – More fiber: fiber relieves constipation and helps to prevent heart disease by reducing blood pressure and diabetes. It also makes you feel full longer, acting as a natural appetite suppressant. Cooking quinoa is so easy. I boil a cup of quinoa in a pot using a 1:1 ratio of quinoa and water for about 15 minutes in medium to low heat, just like the way you cook rice on stove. You can mix with other grains or beans as well. It is so versatile you can use for salads, soup, savory cakes, etc.